Harps duo put Paddy off management! PADDY McCOURT claims Finn Harps coaches, Ollie Horgan and Paul Hegarty have almost put him off the notion of venturing into football management. The Shantallow man, who last week unveiled his plans to open up the Talent Development Academy for young footballers in Derry, has completed his UEFA ‘A’ licence and views coaching as his natural pathway when he eventually hangs up his boots. He’s played under numerous managers during his professional career, including current Scotland boss, Gordon Strachan, Neil Lennon and Tony Mowbray while at Celtic and Northern Ireland international boss, Michael O’Neill to name but a few. However, the former Derry City star reckons he’s had his eyes opened during this season at Finn Harps in the League of Ireland where he’s received a real education in football management from the Co. Donegal club’s manager and his assistant. McCourt admits he’s ‘learned a lot’ from both Horgan and Hegarty since making the surprise move to Ballybofey at the start of the 2017 Airtricity League season. And he heaped praise on the coaching staff at the club, whom he described as ‘workaholics’. “The manager and the assistant manager - I’ve learned a lot from those boys this year about what it takes to be a coach or a manager,” said McCourt. “They have no problem jumping in the car and driving to Cork to do preparation for a game the following week.” he added. For anyone who has watched Horgan and Hegarty in action on the sidelines, there appears to be a ‘bad cop, bad cop’ dynamic with the animated duo, but McCourt says that’s far from the truth. “The two of them are very, very clever men although they probably don’t always get the credit they deserve. “If I ever do go down the line of managing a senior side, well, I’ve learned an awful lot from those two boys. It’s actually put me off management, seeing what you have to be willing to put in,” he smiled. Paddy McCourt was full of praise for Finn Harps manager Ollie Horgan. 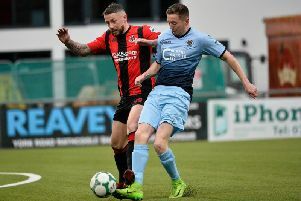 While McCourt’s arrival at Finn Park, following a short stint with Irish League outfit Glenavon, raised quite a few eyebrows, the former Celtic winger is enjoying a ‘different role’ this season playing in front of the back four. “I’m playing a different role this year and I’m enjoying it,” he explained. “It’s a role which is a bit deeper and I can use my passing ability a bit more. I don’t know what kind of money they’re getting down there but it wouldn’t be anywhere near enough to compensate the amount of work they put in. They’re workaholics. Harps’ battle against the drop is intensifying as they sit second from bottom and two points adrift of safety with four games to go. And it doesn’t get much easier as they welcome reigning champions, Dundalk to Ballybofey tomorrow afternoon - a team McCourt knows well from spending much of his preseason with the club. However, with McCourt in the side there’s always the hope of unlocking the Lilywhites’ defence like he’s shown recently with his latest wonder goal against Sligo Rovers. McCourt is one of 11 nominees for the Soccer Republic’s September ‘Goal of the Month’ shortlist for that memorable solo effort which saw him drift past six Sligo defenders before finding the net from an acute angle. Former Derry City attacker, Patrick McEleney - another natural talent to emerge from Brandywell Stadium - also received his customary nomination for an emphatic strike against Shamrock Rovers at Tallaght. So there’s the promise of some excellent talent on show at the Donegal venue tomorrow night with McEleney and McCourt on the pitch as Harps manager, Horgan looks to mastermind a precious victory over Stephen Kenny’s high flying troops.